Whit Merrifield was born on Tuesday, January 24, 1989, in Florence, South Carolina. Merrifield was 27 years old when he broke into the big leagues on May 18, 2016, with the Kansas City Royals. His biographical data, year-by-year hitting stats, fielding stats, pitching stats (where applicable), career totals, uniform numbers, salary data and miscellaneous items-of-interest are presented by Baseball Almanac on this comprehensive Whit Merrifield baseball stats page. 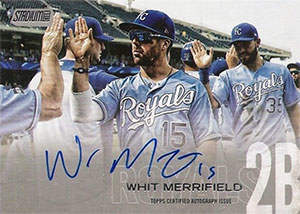 Whitley David Merrifield is an active Major League Baseball player who has spent his entire career with the Kansas City Royals . Whitley, his nickname, is a contact hitter with a great eye , starting his big league career hitting safely in each of his first eleven starts. He recorded a single or better in 30 of his first 35 games, third best streak of the new century, behind David Dahl (32 of 35) and Ichiro Suzuki (33 of 35). Did you know that when Whit Merrifield completed his sophomore season ( 2017 ), he had led the American League with 34 stolen bases ? Whit Bird was the third Royal , joining Amos Otis and Carlos Beltran , with 30+ steals, 30+ doubles, and 19-or-more dingers! Did you know that when Whit Merrifield led the American League in stolen bases in 2018, he became the first Kansas City Royals ' player to lead the league in consecutive seasons ( 2017 - 2018 )? Whit Merrifield also led the league in hits in 2018 , a rare feat done before by Honus Wagner (1908), Benny Kauff (1914), Ty Cobb (1909, 1911, 1915, 1917), Snuffy Stirnweiss (1944), Ichiro Suzuki (2001), and Dee Gordon (2015). Did you know that Whit Merrifield put together a wrap-around 31-game hitting streak that began in 2018, continued in 2019, and broke the record for longest hitting streak in Kansas City Royals ' history, set originally by George Brett ?